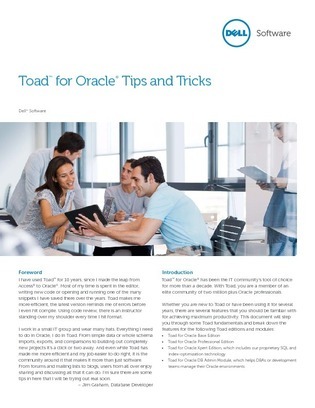 Toad for Oracle is a staple for database developers looking to maximize productivity and simplify collaboration; but regardless of your role in an organization, if you use Oracle, then there's something Toad can offer you. In this comprehensive white paper, learn how Oracle’s solution for database development and administration can help you to work and collaborate with accuracy and ease. The resource explores the functionality that Toad can bring to app developers, PL/SQL developers, and database administrators alike.